Do I have a treat for you today! 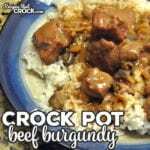 This Crock Pot Beef Burgundy recipes is super simple and so delicious! Everyone from young to old will love it! Place your beef in the bottom of your 4-quart crock pot. Mix together your remaining ingredients (except for your rice or noodles) and pour over your beef. Cover and cook on low for 5-6 hours until your beef is tender. Serve your beef and gravy over rice or noodles. I used my Right Size Slow Cooker for this recipe. I love taking it on vacation because I can take one slow cooker and have a 2, 4 or 6 quart slow cooker all in one! I used it on the 4-quart setting. You can choose to serve this over cooked egg noodles or cooked rice. Either would be completely delicious! We loved it over rice! I chose a package of already cubed sirloin. However, if you want to buy one that isn’t already cubed, feel free to cube it yourself. It will just a couple minutes to your prep time and will still work wonderfully.